Physical aggression was defined as conduct disorder (i.e. violating the basic rights of others, disregarding age‑appropriate social norms) or physical aggression (e.g., kicking or hitting other children). Indirect aggression is defined as non‑physical behaviour to cause harm to others. It includes behaviours such as gossiping and social exclusion. High/low behaviour was determined by the 10th/90th percentile cutpoints (as appropriate). 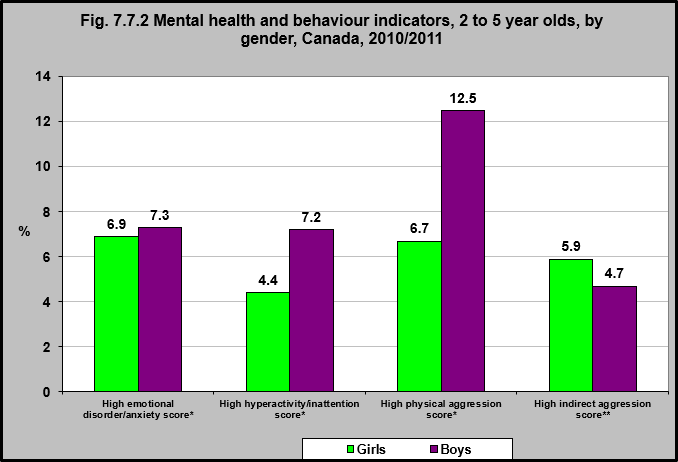 In 2010/2011, boys were more likely to score high than were girls on the physical aggression scale and the hyperactivity/inattention scale. Girls were more likely to score high than were boys on the indirect aggression scale.